Last Friday the India Team traveled to a village near Poonamallee called Kuthambakkam. It is a neat little village, tucked into the land surrounding the greater Chennai area. We had the privilege of speaking to one of the village’s prominent members, R. Elango. Elango is an older man and as such has the standing to call us his children. He is a well-kept, proud but humble man. While we were there he told us about his experience as Panchayat President. A Panchayat is a form of local government. It is a committee with the leader being the Panchayat President. As the President, he managed to eradicate the illegal distilling and sale of alcohol in the village and helped erase caste discrimination. He did not end poverty completely, but he was able to make sure that nobody in the village is starving, and the upper-and-lower-classes are no longer at war with each other. He also gave us a presentation on the vision for his village. He is a chemical engineer by training, but as the Panchayat President wore many hats of a civil engineer, an electrical engineer, etc. He helped bring technology such as compressed bricks that don’t require firing. They can be made with the local resources to the village allowing everyone to build a house. Some of the houses are less extravagant than others, but everyone in the village has a sturdy house that will not be destroyed in the event of a flood or monsoon season. This simple task was not easy, but gave the lower-classes a sense of pride. We learned about Elango’s plan to set up a network of villages where 30 or so villages will get together and each one will specialize in one area. Each village isn’t large enough to have a specialist in all fields so by specializing by village the network can rely on itself and keep the local economy strong. That way the wealth doesn’t leave the village to the city leaving the village poor. This also helps the landless people by giving them jobs and making them “local producers” as Elango calls them. Elango is very focused on sustainable social and economic development. He has made it his mission in life to help people by demystifying technology and is going through a process that he calls “unlearning”. We are very thankful for his help since he is helping us develop the solar system we are implementing in the village closer to KVCET in the village of Kunnankulathur. When we arrived to the school in Kunnakulathur, the headmaster, Gajapathi told us that they were not as interested in solar street lights as they were solar panels. So, we switched our plan from solar street lights to panels. Gajapathi wanted us to be able to put the panels on top of one of the new school buildings, but because the buildings are still undergoing construction, we won’t be able to do that. Instead we will be placing them on top of an academic building to power their computer lab. 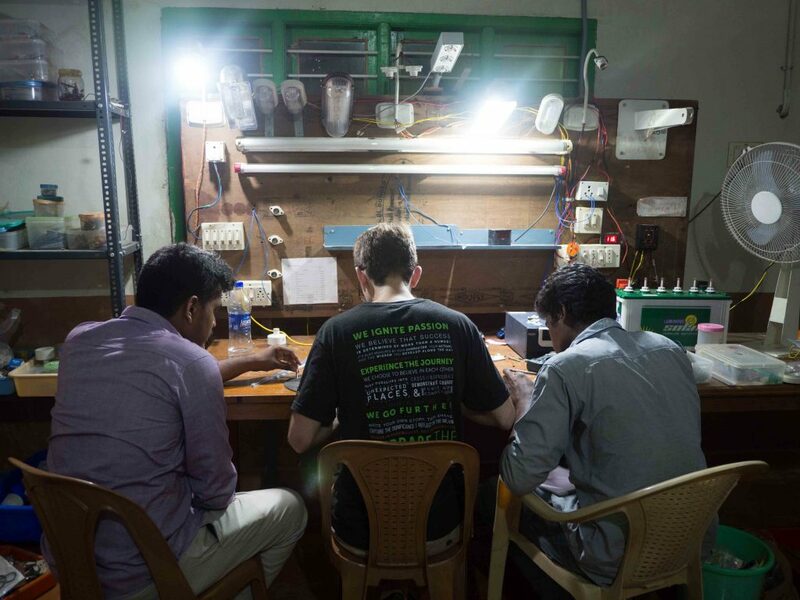 This past Wednesday and Thursday we spent our time in Elango’s village of Kuthambakkam helping to build the stand for the solar panels and also helping his intern, Jonas, solder the new LED lights that we will be putting into the school. Julian, hard at work soldering low power LED lights. The lights will be put into the Kunnankulathur Government High School. From left to right we have Vishal, our guide; Julian, teammate; and Jonas, Elango’s Electrical Engineering Intern. Jonas helped us quite a bit with the solar project. And is going to help us some more in the days to come. 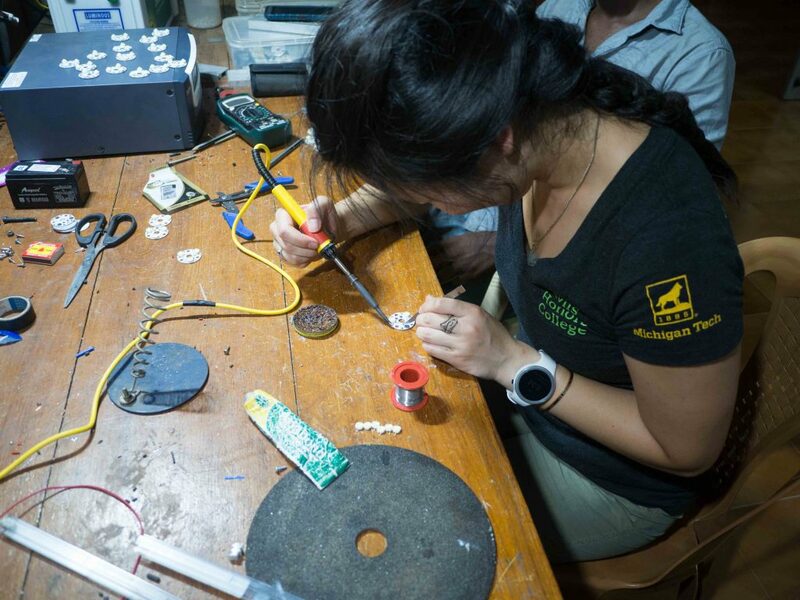 Sarah Soldering an LED to the low power lights. The lights each have 4 PCBs with 3 LEDs each. This makes for a total of 12 LEDs per light. Each LED consumes 1W of power for a total of 12W per light. This is a huge improvement from the conventional 40W tube lights. The LEDs are first coated in the brown stuff in the circular tin in front of me, flux (this was new to me since all the solder I’ve used before had flux inside the solder itself); then the stuff in the green tube, a thermally conducting but electrically insulating paste, is applied to the back; finally the LEDs are placed on the PCB and soldered into place. The energy saving lights use only 12 watts (W) each. This is a hefty improvement from the conventional tube lights that consume 40W each. In addition to energy saving lights we are providing energy efficient fans that consume a maximum of 28-30W which is an improvement on the 60W that conventional fans use. We are providing eight LED lights and two Brushless DC fans. This along with four 100W panels and six 80 amp hours (AH) batteries will be used to run the lights and the fans along with a computer in their computer lab. The lights and the fan will always be able to use just the solar power, but the computer will use the solar mainly as a backup power supply in the event of a power outage (which are fairly common here, in fact we had one today). This week we also assessed what needed to be done with the water filter in order to make it work properly again. Due to some clogging (maybe from our new frog friend, Frances, that we found hanging out in a pipe?) and other small maintenance issues, the filter hasn’t been working properly. However, we have diagnosed the issue and are making a plan to work on returning the filter to its former glory. We are very proud of our work so far and thankful for the help we have received along the way. Next week we will work on installing the solar system as well as extensive water filtration maintenance.